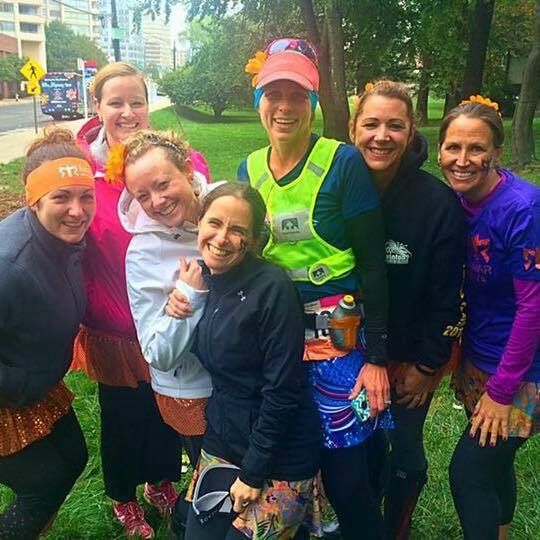 For those of you just stopping in to read about my MRTT chapter’s Moms RUN This Ragnar experience at Ragnar DC, you can catch up by clicking on Part 1, Part 2, and Part 3 to check out my three previous recaps. I left off yesterday as we were finishing our breakfast at Dunkin’ Donuts and ready to take off for our final major exchange where we would try to finally get some sleep while waiting for Van 1 to finish their final set of legs before handing off the slap bracelet for us to take home to Nationals Park in DC. I crawled in the far back seat of our van and somehow managed to get almost an hour and half of halfway decent sleep. One of my lovely teammates took a very unflattering picture of me sleeping and posted it to our MRTT Facebook page, and I agreed to forgive her only if she would let me use her cot at Ragnar Trail Richmond in April. She agreed, and all is forgiven! When Van 1’s final runner came in and handed off the slap bracelet to Kim, they were finished and just had to wait for our van to finish so we could all cross the finish line together. Later, while waiting for Amanda to come in from her run, Kim took this picture of me. 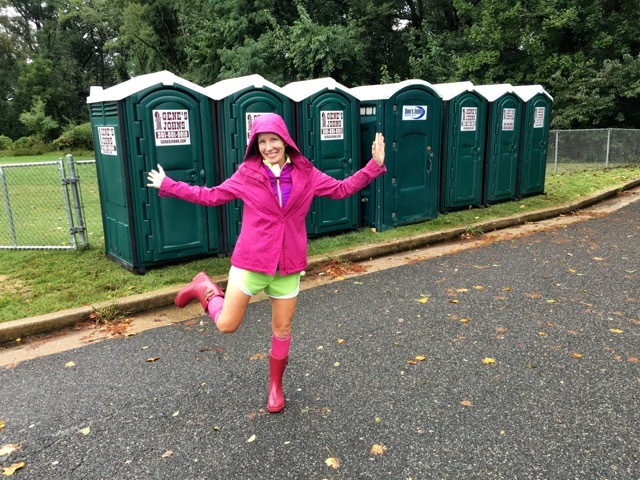 I think it says it all for our experience at 2015 Ragnar DC – rain boots, compression socks, slicker, porta potties, and a huge smile on my face! For a short period of time the rain stopped, and we hoped that we would have clear sailing for the rest of our race. Weather forecasts called for the rain to resume around 7 PM – well after we were expected to finish. Finally, after problems with rain, wind, and mud, Debi was able to get her pop-up tent out during the calmer weather and change clothes for her next leg in privacy! Prior we had designated the far back seat of the van as our changing room when a rest room wasn’t available. Last year without all the rain, we changed behind the van with the two doors open to provide a little privacy on each side. 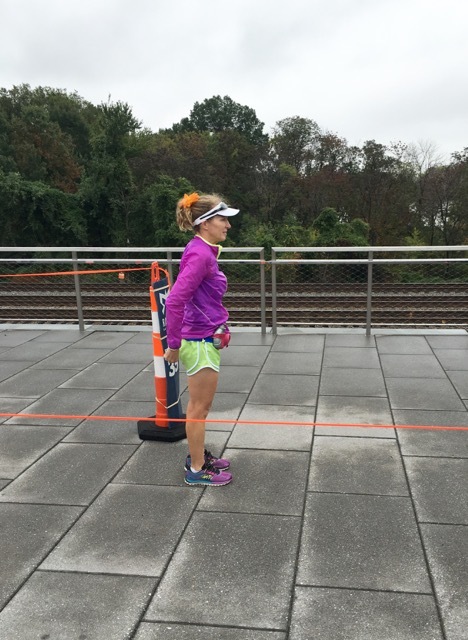 Our runners continued to click smoothly through their legs during the late morning as we made our way from Maryland, into DC, then into Virginia, and back into Maryland. 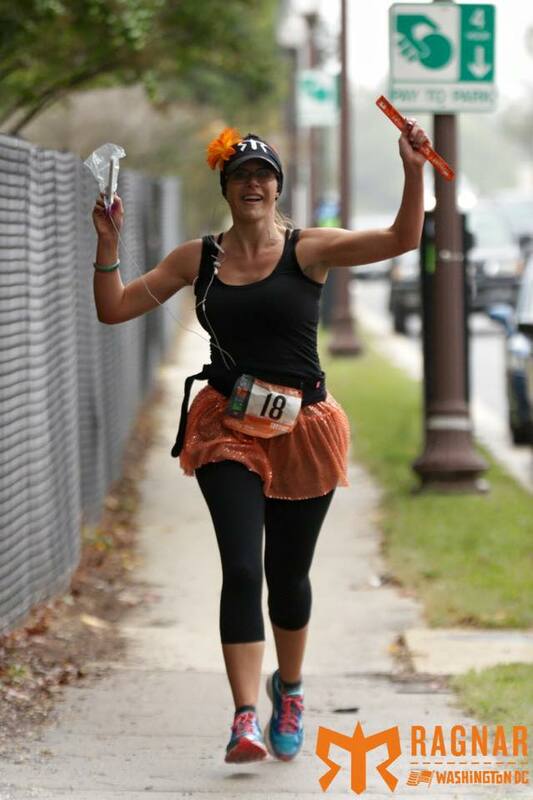 A Ragnar photographer captured this fantastic picture of Rachel as she came in from her final run – look at those gorgeous arms and shoulders! While waiting for Rachel to finish, I had the pleasure of catching up with Erika who was volunteering at that exchange. 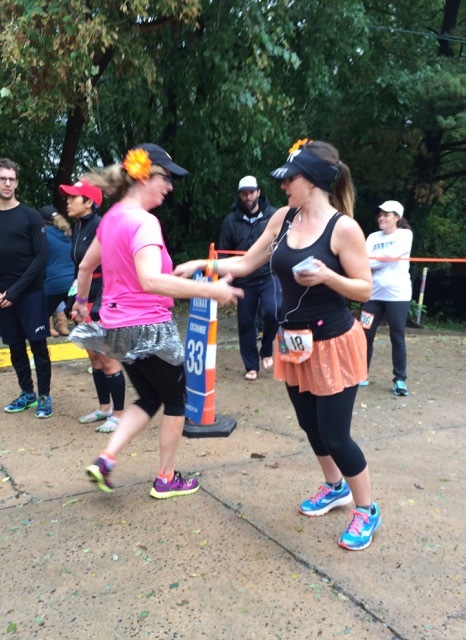 As Rachel turned the corner for an uphill sprint to the exchange, I chased her to get a picture of her exchange with Debi. 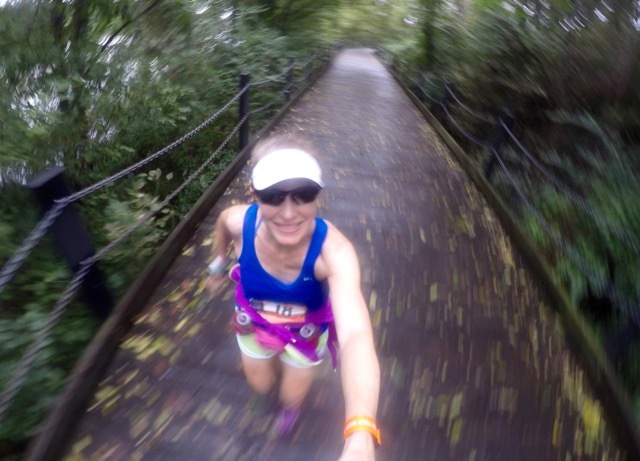 Debi immediately took off at lightning speed (she’s one fast mama), and as she headed out for her final leg, the photographer snapped this terrific picture of her. After Debi took off, we all jumped in the van to get me to my next exchange. With the temperature hoovering around 50°, no rain, and wind gusts of up to 13 mph, I chose to wear shorts and a tank, but put on a thin shell jacket to wear until it was time to start running. A few extra big gusts of wind kicked up as we waited and I decided to keep my jacket on, afraid that the wind might get worse and I’d get cold. At about the same times as I saw Debi heading toward me with a great finishing kick, I realized that I hadn’t turned on my Garmin. Debi finished and handed me the slap bracelet just as my Garmin found a signal. It was then that I noticed that its battery was almost dead because I’d failed to recharge it after my previous two runs. I looked at Kim’s wrist and with begging eyes asked to use her Garmin. We quickly exchanged watches and I was off. Fortunately, I had already turned on Glympse and had remembered to invite Bill, Amanda, Kim, and my Cruiser friend Chuck to follow! Within a minute of running I realized that jacket was a big mistake and took it off and tied it around my waist where it remained for the rest of my run. 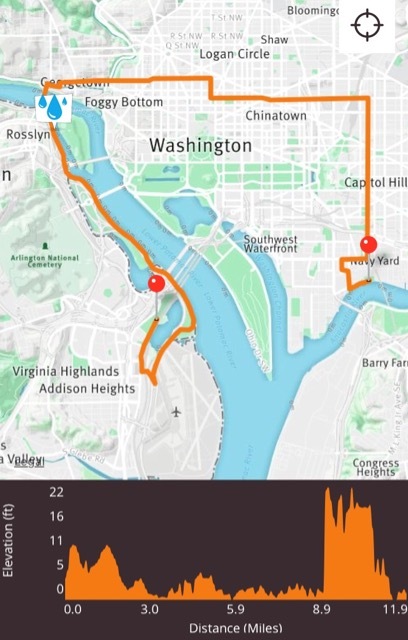 My course would take me out of Crystal City on the Mount Vernon Trail running along the Potomac River until I crossed the Key Bridge from Virginia into Georgetown. After making our way through Georgetown we would head into Southeast DC eventually finishing at Nats Park. Shortly after starting my final 11.9 mile leg, I saw a sign for a left turn. I noticed that the lady in front of me ran straight and didn’t turn so I called after her. It ended up that she was just out for a run and wasn’t running Ragnar; however, a runner coming toward me thanked me profusely. She had missed the turn on her way out and had run to National Airport – about a two mile round-trip mistake. We introduced ourselves (her name was Dottie) and settled into a comfortable pace. After a few minutes she needed to stop and stretch and sent me on my way. 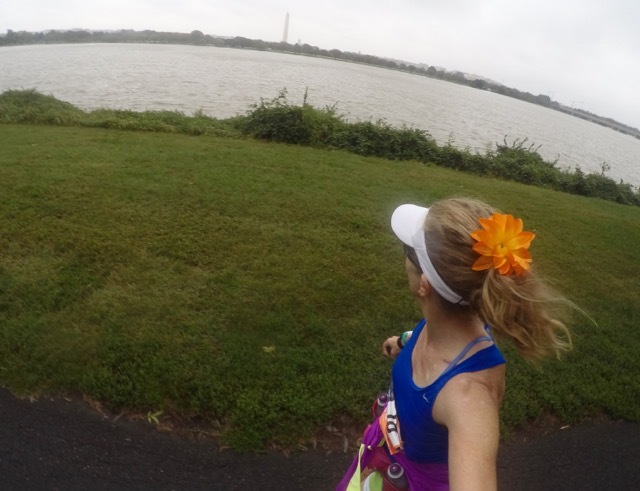 I was a bit disappointed because we seemed very compatible, and I was looking forward to having a running buddy. My friend Chuck had planned to meet me, but when I missed a call from him, I assumed that he wasn’t going to be able to join me. And then got this selfie as I ran along this beautiful boardwalk that felt great on my legs! Once I got into Georgetown and got caught by my first of many traffic lights, Dottie caught up with me. I was thrilled to see her again, and we decided to stick together. Ragnar is very strict about having their runners adhere to all traffic rules, and we were told to run on the sidewalks and not run in the streets. We were also reminded not to cross streets until we had the walk sign. Our first test was the crowded streets of Georgetown. We ran through during a busy Saturday afternoon and had to dodge people repeatedly. I wonder what all of those clean, well dressed shoppers thought of us stinky runners weaving in and out? Because we were able to rest anytime we came to a “Don’t Walk” signal we had plenty of opportunities to catch our breath, and as a result were able to run much faster than we would have without the rest breaks. Amanda said it was really funny to watch me run fast, stop, run fast, stop, run fast… on Glympse. While running through Southeast DC, another runner barreled his way between Dottie and me claiming he was getting two kills at once. It was Chuck. He was on my Cruisers Rockin’ the Relay team last year and was so sweet to volunteer to join me for what I thought would be a tough run. Chuck had gotten a late start and had run hard to catch up, and it was because of Glympse that he was able to find me! Chuck ran with us for about six miles and those miles flew by as we caught each other up with updates about work, our children, and mutual friends. 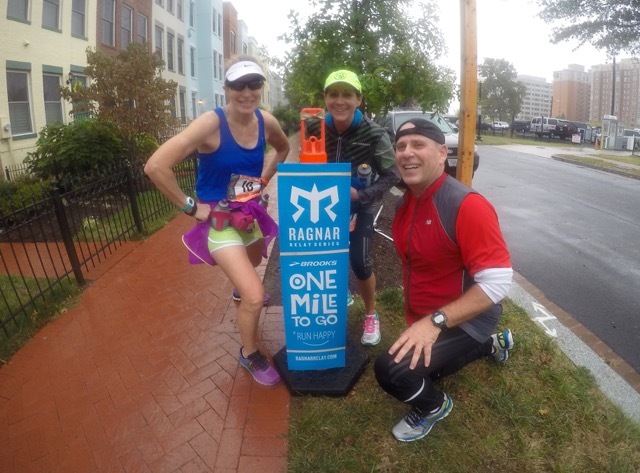 The three of us stopped long enough for a picture at the glorious “One Mile To Go” sign just as the light drizzle turned to a steady rain. As we approached Nats Park, a volunteer told us to go straight across the street and then turn right and run until we got to our final left turn onto the bridge. Following her instructions we starting running straight across the street – right into oncoming traffic! A couple of car horns honking and runners yelling quickly got our attention and we jumped safely to the other side. After being up for about 33 hours with less than two hours of sleep and closing in on running 30 miles in under 24 hours, I wasn’t thinking straight and made a stupid mistake. Fortunately, none of us were hit. After that little near mishap, Dottie, Chuck, and I made that final left turn onto the bridge and it was just a matter of running strong until Dottie and I found our teams. 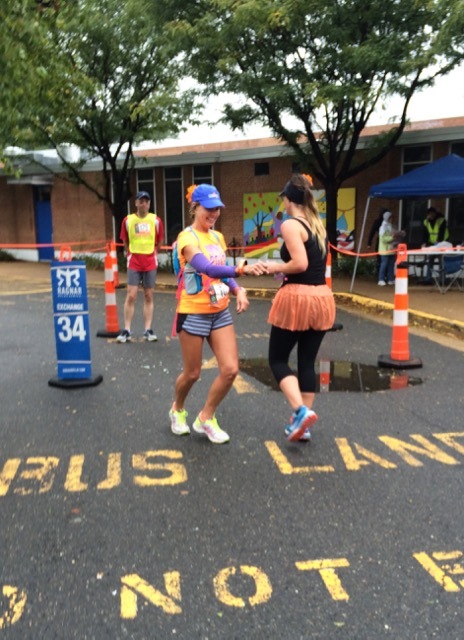 And there they were, the most glorious sight in the world – my Moms RUN This Ragnar teammates! 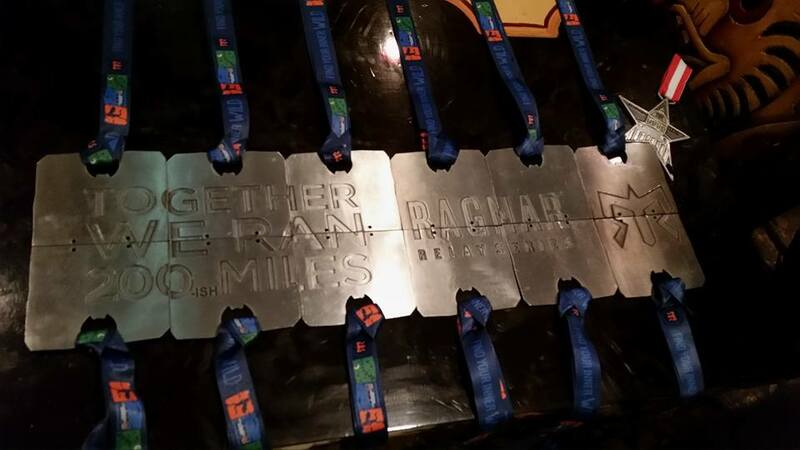 Together we ran the rest of the way across the bridge and under the Ragnar arch to become Ragnarians! We finished our 204.2-mile race with a time of 35:15:59 (10:21 average pace). Our team finished 15th out of 29 women’s teams (there were 331 total teams). I gave Chuck a quick hug goodbye and thanked him for joining me; and then saw Dottie with her team and thanked her for the great conversation and for helping make the miles fly by. With rain coming down and the wind kicking up, I happily slipped on my team shirt for our official finishers picture. 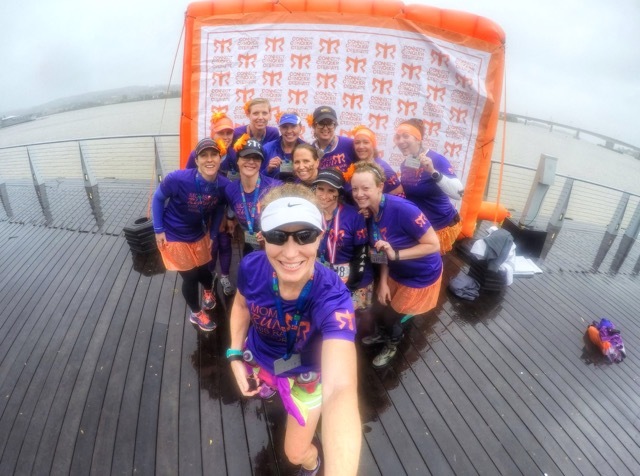 The photographer was kind enough to suggest that I step forward with my GoPro for a quick picture before she called the next team for their official Ragnar picture. After a quick stop at one of the tents, Amanda, Rachel, and I collected our Mudslinger Medals. 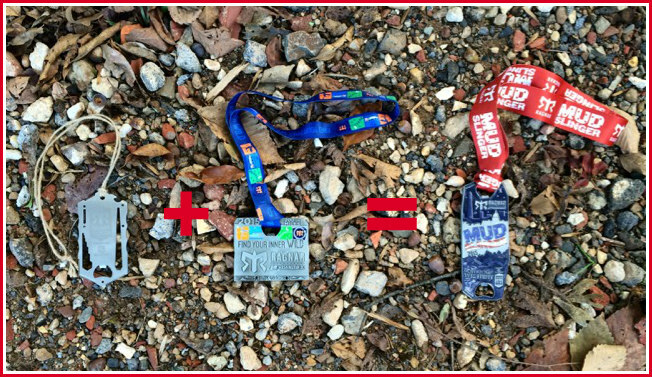 We had earned these medals for running both the Ragnar Trail Appalachians WV in June and the race that we’d just completed within the same year. Considering the weather conditions at both races, Mudslinger was a very appropriate name! Our swag bag contained a woman’s fit technical shirt with a pretty cool design on the back. I’m not crazy about the boring gray color, but I don’t already have a race shirt that color, so it’s all good. 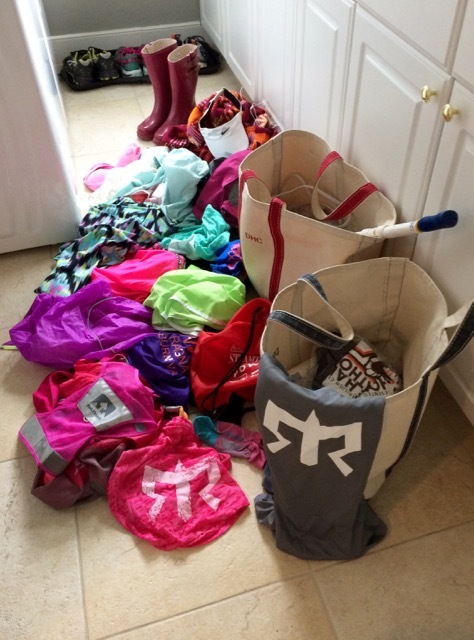 After a rainy, messy two days away, I had a pretty nasty smelling laundry room. 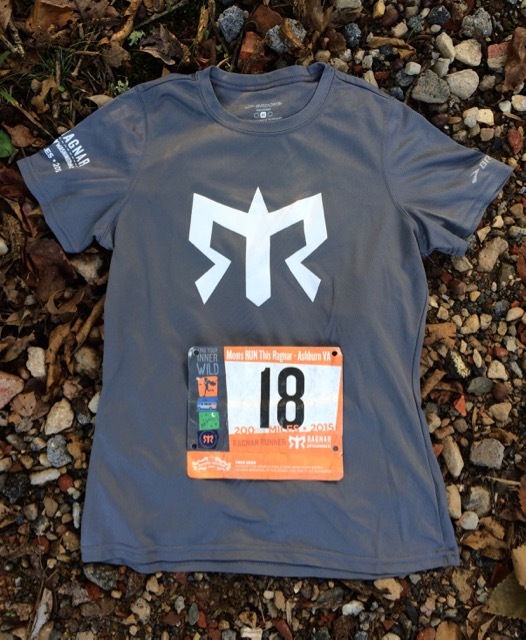 And yes, those two Ragnar shirts were rearranged and straightened out so the Ragnar logo would show! Just three days after our race, our team (minus Céline), met at El Sol Azteca Mexican Restaurant for a reunion. 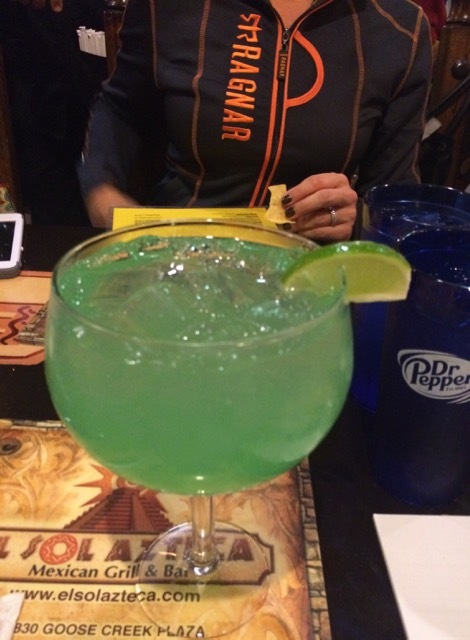 It was ladies night – half price food and drinks; and boy did we have a great time! After dinner we put our medals together upside down to see the special message on the back. 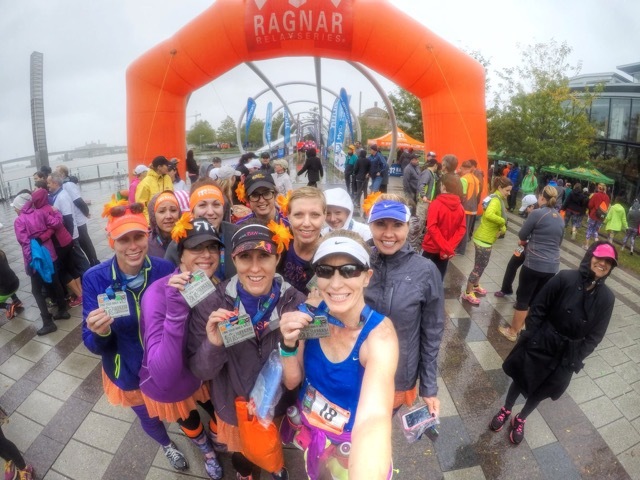 Most of the runners on our team have already committed to running Ragnar Trail Richmond in April, myself included. 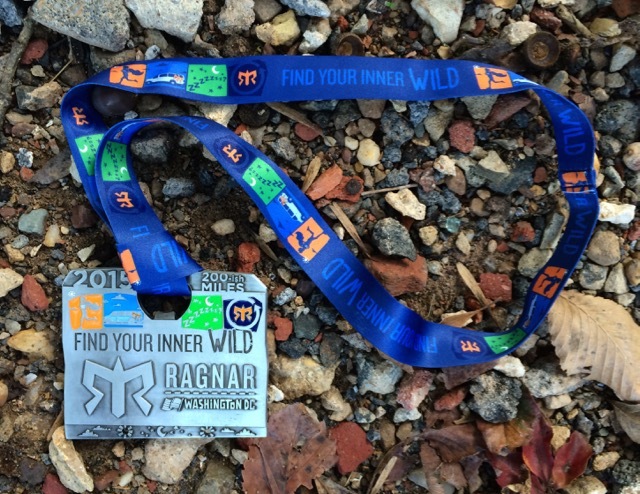 I think the following five lines sum this Ragnar thing up pretty well…..
Making memories to last forever. What are you willing to lose sleep for? 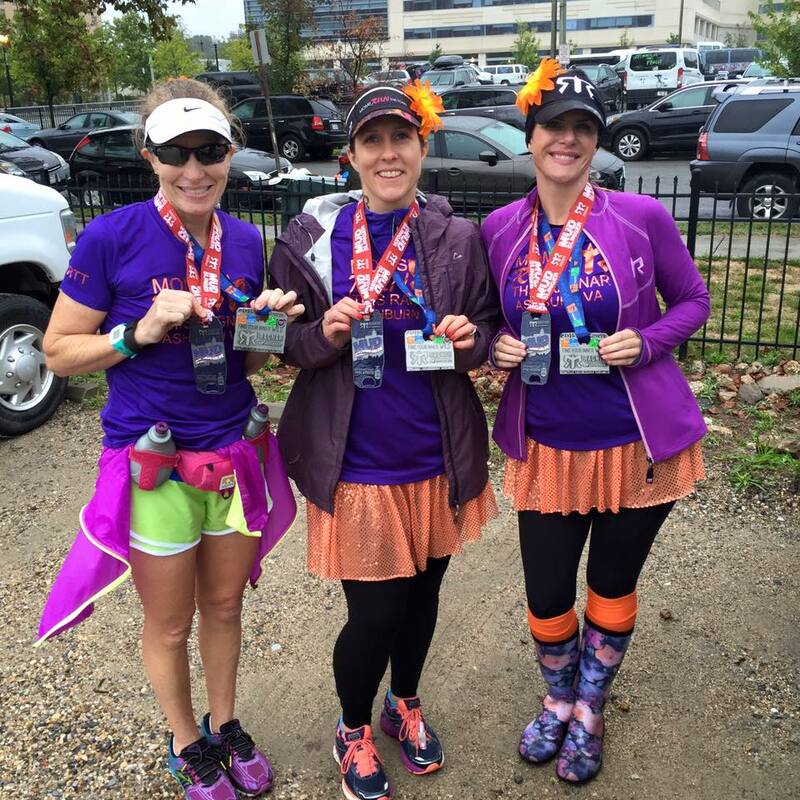 Have you run a Ragnar or similar relay? 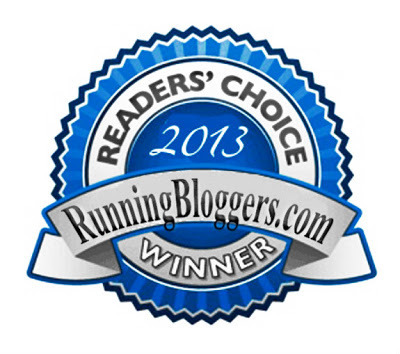 Congratulations on your Ragnar race. What an accomplishment! Love the saying when all the medals are together. That is such a nice touch. How clever with that pop up tent to change into. I would like to run one some day but running at night sounds scary. 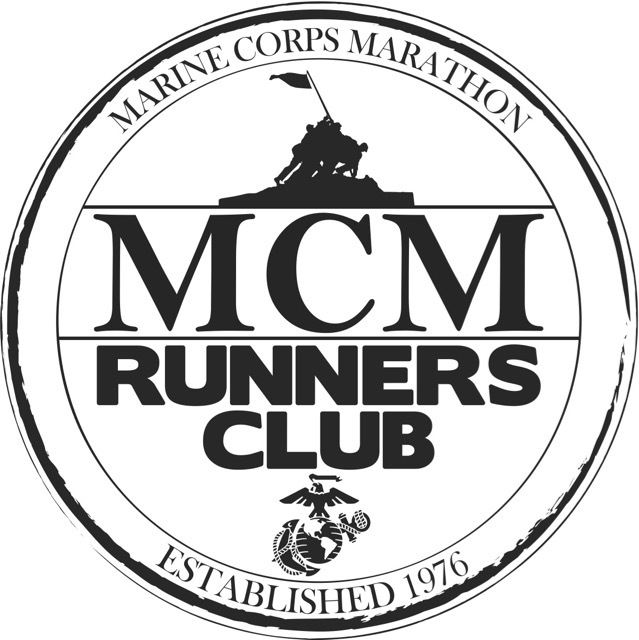 I am running an 50 miler relay at the end of the mth so I’m looking forward to that. 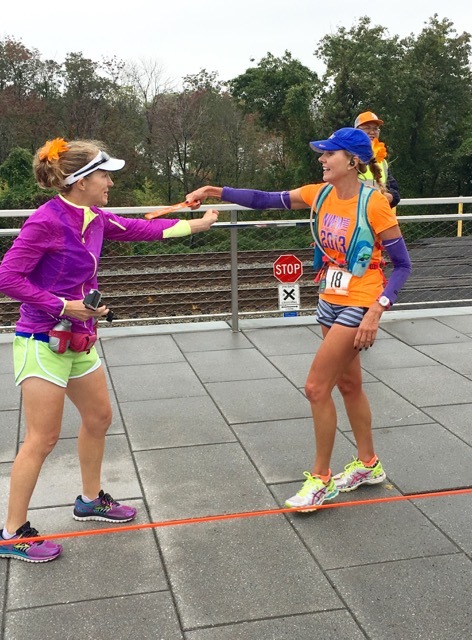 A 50-mile relay sounds like a great introduction! 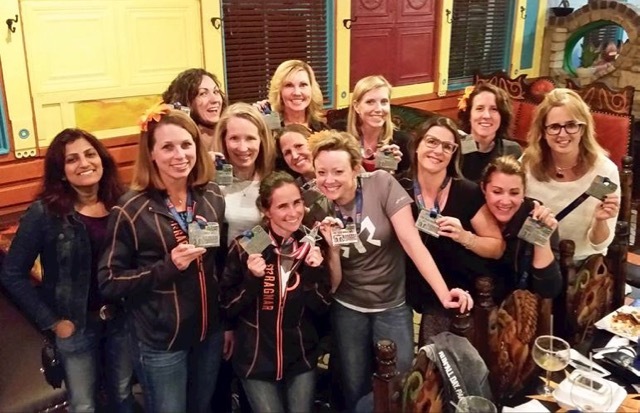 My MRTT chapter has already signed up to run Ragnar Trail Richmond in April and we’re running buddy system – we will field two regular teams and two ultra teams. I’m on one of the ultra teams and my friend Meagan will be the same runner number on the other team, which means we will always buddy together to run our legs. Our two teams of runners of each distance will run together no matter what. It can get extra scary in the middle of the night out on trails! Wonderful Wonderful Recaps!! The Van #2 experience was awesome to experience by you-thanks!! You mama’s sure did have fun! That Glympse App sure did come in handy!! 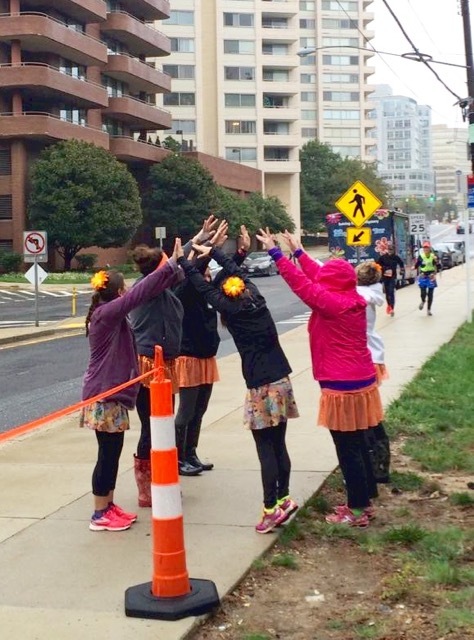 I wonder if Ragnar will change the Georgetown route in the future? I wonder about Georgetown, too. They failed to calculate Runner 12’s time correctly because they didn’t factor in the traffic lights. Our team captain got a text Saturday morning from Ragnar reminding the captains to expect Runner 12 to take a lot longer than anticipated. Gylmpse surely helped my teammates predict when I’d be coming in! A fantastic recap, as always! It looks like you guys had an amazing time despite the weather! You brought the sunshine! Thanks, Anne! Ragnar didn’t disappoint! 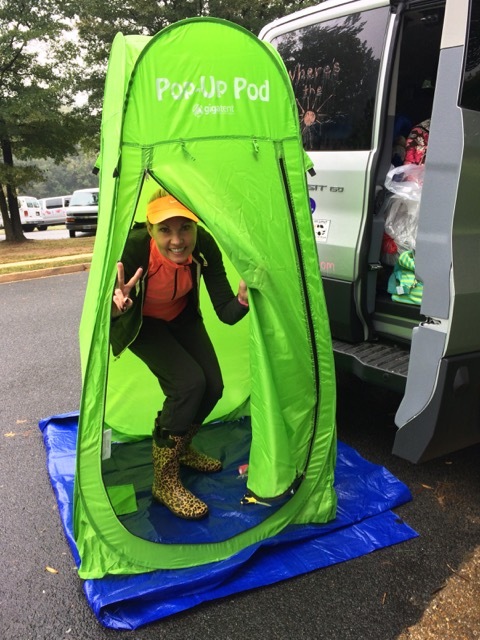 That pop up pod looks like a must have for us next time! It was cute, and we all cracked up when Debi showed it to us! I didn’t have rain boots for Ragnar Trail Appalachians and trying to walk through all of that mud was awful! I’d just bought my boot a few weeks before Ragnar DC and wouldn’t have remembered to pack them if my team captain hadn’t reminded us! It was glorious having dry feet between runs, wasn’t it? 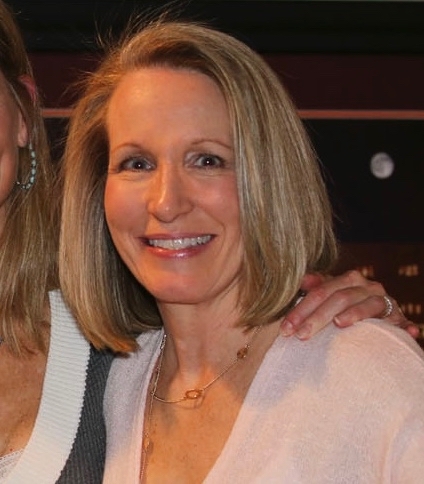 Fantastic recap Debbie, and totally inspiring! You are all amazing!!! So glad Chuck caught up with you for the final leg. Ragnar Rocks, love it!!! Thanks, Joe! It was so fun having Chuck join me for such a big moment (well, and six miles leading up to that moment). Congrats! Sounds like a fun time despite the rain! Another Ragnar in the books! And you have yet to do one where it didn’t rain. I am hoping we will have glorious spring weather, sans rain, in April! I’m glad Chuck was able to catch up with you. That was so nice of him to come out and run with you! 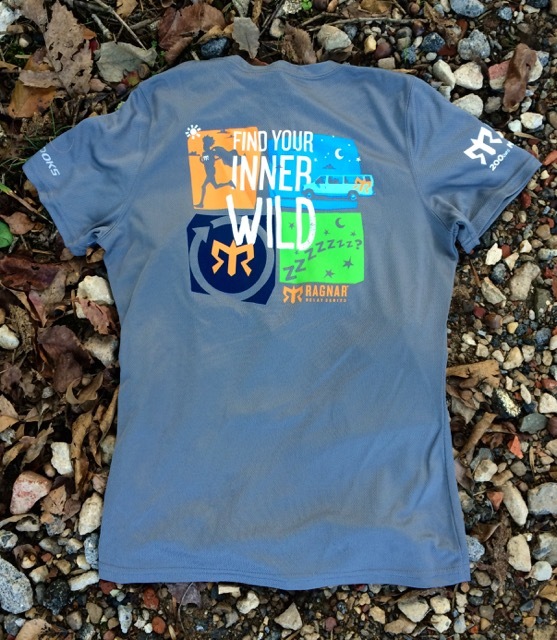 I’m not crazy about the shirt color (only because I have gotten 3 gray race tshirts this year), but the design on the back is really cool! I love the medals, too. You definitely earned that mudsligner. Is that boardwalk on the Mt. Vernon trail? 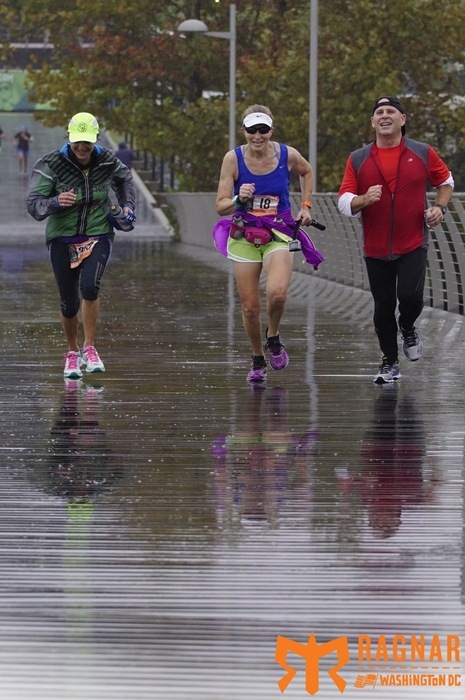 Fortunately at our first Ragnar, I had two runs in the dry, and only drizzle during part of my final leg. And yes, wasn’t it so sweet of Chuck to join me?